I'm trying to figure out Larry Kolb. He is a "former" CIA man, confidant of Muhammad Ali and son-in-law to Adnan Khashoggi. Kolb's name came up during the 2004 election, when he claimed that a crooked Republican party operative named Richard Hirschfeld had worked out a scheme to concoct a false tie between Al Qaeda and the Kerry/Edwards campaign. The plot didn't pan out. In 2005, Hirschfeld was found dead in a prison cell. According to Kolb, he had attempted to blackmail Bush. A couple of days ago, I picked up Kolb's autobiographical Overworld. I'm trying to make up my mind as to what to think about it. This work has genuine literary merit; I don't think I've ever encountered a better-written book by a spy. But the author makes clear that he cannot or will not tell the full truth -- which means that any reader must prepare himself for a rather substantial frustration factor. Kolb identifies his father as a "senior United States intelligence official," yet I've never heard of a man named Kolb who would fit this description. I suspect that any truly senior CIA man of that first generation would have received some mention in the literature by this point. Alas, the only Kolb to appear in Namebase is a WWII Army intelligence officer named Eugene, who does not appear to be the same man. A Google search turns up goose eggs, except for those links which lead us back to Larry Kolb's own writings. This passage hints that the man's real name was quite different. But why would Larry Kolb hide his father's identity while giving the real names of so many other figures? The resume of "Lewis Kolb" reminds me of the remarkable career of Ed Lansdale. Both did service in the Philippines, and both had homes in Colorado. But the physical descriptions, birthplaces and the years of death do not match. Larry Kolb may have altered those details to make matters difficult for guys like me. Another possibility: Perhaps Kolb is of Jewish heritage. He may wish to hide his ancestry from his father-in-law's associates. Overworld, which I have not yet finished, is filled with fascinating anecdotes, a few of which I will relate at a later time. But one bit at the end (yes, I skipped ahead) struck me as particularly intriguing. Having made rather too many enemies in the clandestine world, Kolbe finds himself in a safe house in Florida. He spends a number of pages indicating that this small town functions as a sort of retirement village for spooks. (In much the same way, old carnies would retire to Gibtown, also in Florida.) Faded spies are everywhere. Even the guy who bags his groceries is an old KGB defector -- literally a bag-man. And guess who else happens to live in Spook Central? There was also John Forrester Gedney. Mr. Gedney retired recently after more than twenty years as a code inspector, inspecting houses, like mine, for compliance with building codes. You may have heard his name in the movie J.F.K., or read it in a book. For, as Mr. Gedney announced, and proved, last year , he was one of the three railway tramps arrested behind the grassy knoll in Dallas on November 22, 1963. He was the tall one in the grainy, mysterious photograph used so often by conspiracy theorists as evidence that the CIA and other dark forces were behind the assassination of our president. Actually, Gedney is not mentioned in Oliver Stone's 1991 film; he had not "come out" at that time. The film does reference the identification made by the late CIA/Air Force liaison L. Fletcher Prouty -- who felt that the "tramp" in question was none other than Edward Lansdale, with whom Prouty worked closely. (Lansdale later said that he considered Prouty too paranoid!) The photographic identification was seconded by Lt. General Victor Krulak., who also knew Lansdale well. As noted earlier, I suspect that Larry Kolb may be the son of Ed Lansdale. And even if he is not, we can still safely presume that "Lewis Kolb" worked closely with Lansdale in the Philippines. The man Prouty believed was in Dealey Plaza on November 22, 1963 was either Larry's Dad or one of his many spooky "Uncles." Also worth noting: Larry Kolb mentions, in his acknowledgments, that he asked Oliver Stone to read the manuscript of his book. How did Kolb come to know Stone? I have heard previously that Stone made an attempt to contact Lansdale's family. Is Kolb hinting that we should take another look at the Gedney story? While fingerprint evidence does place Gedney in the Dallas jail that day, such evidence can be, as the spies say, "backstopped." We really only have Gedney's word for it that he was a vagabond and a tramp at that point in his life. One can easily comprehend why the Agency would want to place one of their own contacts near Oswald in that jail. Gedney lives in Melbourne, Florida. Presumably, this was the location of Kolb's safe house -- and of all those other "former" intelligence officers, including the KGB guy turned bag-man. (The name of the town is not mentioned in Overworld.) Melbourne also happens to be the home town of two private "spooked up" airlines run by the notorious Blackwater corporation. If you happen to pass through that burg, and if you run into either John Gedney or Larry Kolb, tell 'em I said "Hi." A small correction is in order. You state: "The film does reference the identification made by the late CIA/Air Force liaison L. Fletcher Prouty -- who felt that the "tramp" in question was none other than Edward Lansdale, with whom Prouty worked closely." The ID made by Prouty and Krulak was NOT of a "tramp," but of a besuited bystander walking past the "tramps" while they were being paraded in front of the TSBD. A small point, perhaps, but I know you are stickler for such details. you've got this post listed twice, you've probably already noticed but fyi. Help out an anklebiter, please: what does "backstopped" mean? Jen, you caught me. I should not have included that phrase without defining it. "Backstopped" means salting the record with documentary proof of a false story -- such as, for example, placing an arrest record in the Dallas PD files, one which no-one was ever able to find before, even though people have looked. I suppose one can say that backstopping occurs in the art world, when someone cobbles together a fake provenance for a forged painting. Overworld was some book, all right. I found the parts about Khashoggi and that Indian guru to be the weirdest...great Muhammad Ali stories, too. That said, I don't know what to make of him, either. You are right about Kolb's voice. But there is something creepy about the guy. I mean, he seems to like EVERYONE, from Manuchar Ghorbanifar to Daniel Ortega. A guy like that may not have a standard for making political judgments -- or, worse, if he does have a standard, he hides it very well. You know what else is strange about that book? Larry travels the world hobnobbing with the rich and famous. But we are never given a clear idea as to what he does for egg and cheese money. Kolb doesn't exactly spell out his father's occupation, but if you read into it he was an Army Counter-Intelligence Corps officer during WWII. After the war he integrated into the Air Force (when it was created in 48) and retired as a Colonel most likely in the super-secret OSI. That is the Air Force branch responsible for counter-intelligence. Not sure why Kolb isn't more specific, maybe leading readers to think CIA would be sexier and sell more books? Bingo. His dad was Army and then OSI. 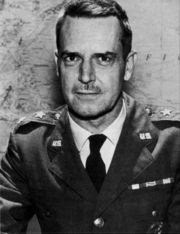 During the height of the cold war, Col. Kolb was in charge of counter-intelligence in the European theater. I don't know how it is now, but at the time, the OSI had 4 deputy directors (generally colonels) and a director (generally a brig. general). Each deputy director had responsibility for one of four theaters of operation.